Dream Depot is a place, said to be in outer space, where all dreams in the Mushroom Kingdom go. 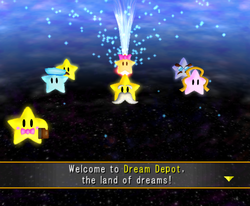 Dream Depot is guarded by the seven Star Spirits from Paper Mario. In the Story Mode of Mario Party 5, Bowser and Koopa Kid try to take over the Dream Depot and cause the residents of the Mushroom Kingdom to have the inability to dream. Hearing this, Misstar requests Mario and his friends to stop Bowser and Koopa Kid. They have to defeat the Koopa Kid trio and chase Bowser and Koopa Kid across four out of six dreams (in random order) including Toy Dream, Rainbow Dream, Pirate Dream, Undersea Dream, Future Dream, and Sweet Dream, until they reach Bowser's dream, the Bowser Nightmare, where they play a final minigame, Frightmare, to defeat Bowser. Yume Mīru Corruption of ｢夢見る｣ yume miru, "I dream". This page was last edited on March 20, 2018, at 09:25.